on verso signed, titled, dated November 1967 and inscribed "Toronto", "Acrylic Polymer W.B." 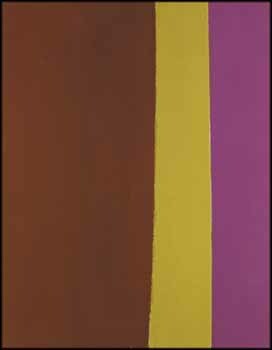 and "A 1754"
By 1964 Jack Bush's Sash format began to give way to another powerful motif, in works referred to as his Fringe paintings. This format, employing stripes and bars, became a major element that Bush continued to use until at least 1970. Green Stripe, though not strictly a Fringe painting, draws on these common elements. In his insightful analysis of the artist's paintings, Marc Mayer states, "We admire him as a colourist largely on the evidence of his Fringes wherein he made a good show of his articulate palette." Articulate indeed, and Bush often takes us by surprise with his fearless and spirited colour associations and his subtleties of composition and technique, only fully appreciated when we allow our gaze to linger. Green Stripe’s deceivingly simple three vertical bands are not hard-edged stripes but confident, hand-applied staining onto the canvas ground. The title seems deceptive if one expects to see a conventional green rather than this luscious avocado hue, in the company of rich chocolate and smooth aubergine - and what an elegant dish it is!